Noise rap trio Death Grips (MC Ride, Zach Hill, Flatlander) arrived last year with the Exmilitary mixtape and plan to follow it this year with two full lengths, The Money Store and No Love. Both albums will come out on the group’s new major label home, Epic Records. The Money Store is due out on April 24 and No Love will be out this fall. Death Grips have been revealing videos and tracks from The Money Store. If you’re at all worried that the major label signing will lead to Death Grips cleaning up their sound, fear not. Other than some bigger sounding production quality (which only helps the group), they sound as heavy and out-there as ever. The videos for “Blackjack,” “Get Got,” and “The Fever (Aye Aye)” are below. You can also download “Get Got” and “Lost Boys” above or stream them below. The album’s artwork and tracklist are also below. 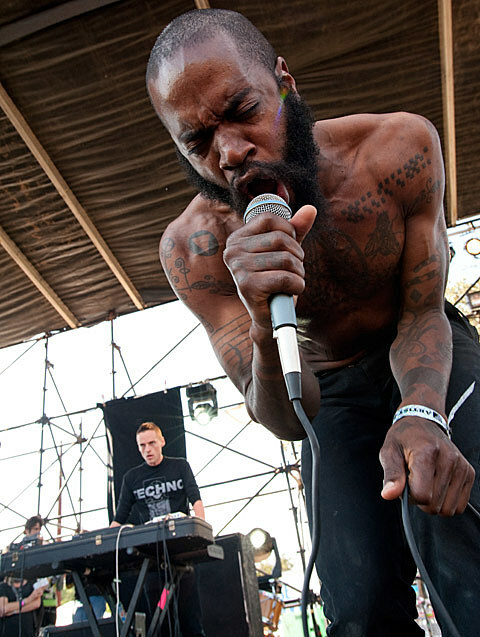 Death Grips have a few upcoming dates scheduled for 2012 including Coachella and a pre-Coachella show in California with Refused. In late May and June, they’ll head to Europe for a few festivals and upon returning to the US, they’ll play a NYC show at Music Hall of Williamsburg on June 13. They’ll also return to the NYC-area in September for ATP I’ll Be Your Mirror NJ. Tickets for the MHOW show are on AmEx presale now and go on sale to the general public on Friday (4/6) at noon. UPDATE: even more tour dates have been announced and are listed belo. The piece itself is a musical instrument. Our real performances are disassembled, mangled, and thrown back together in a renegade way. We recommend the “PLAY ALL” button. This is exactly how we create our art. It’s dirty, chaotic, and constantly on the brink of catastrophic failure. We encourage others to deconstruct our ideas and this piece in similar ways. We are excited about people creating their own content out of this device. It’s not about the machine itself but the process of exploration. You can check out the full project at the Death Grips website and the individual clips on YouTube.